The Dijko Tunnel Rack Oven is unique. It has been specially designed for use in bakeries and confectioneries where products may be baked on trays or in tins. The system is suitable for producing a wide range of products including the many varieties of bread, pizzas, pies, biscuits and full range of cakes, cookies and pastries where automatic handling through any of the proving, baking and cooling stages will be economically beneficial. Optionally, the system may be supplied with or without proving and steaming sections. 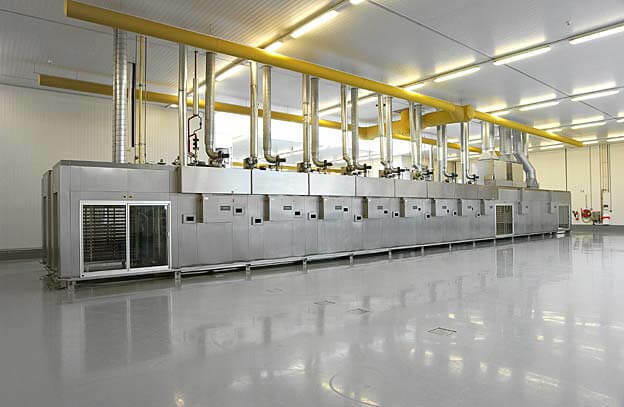 A system for bread, rolls and fermented goods production would normally require prover, steaming, baking and cooling modules whereas pies, tarts and cake making operations would require only the baking, inspection and cooling modules. Mixed production can be accommodated within the full system. The tunnel system is of modular construction and can be used whenever baking temperatures up to 300 degrees centigrade are needed. Appropriate modules can be supplied for most required production capacities and, if necessary, extra modules can be added at a later date. Baking trays are placed in special racks, with insulated front, back and base panels. These are automatically transported through the system. There is minimal use of floor space, often as little as 2O% of that required for a conventional traveling oven of similar output, and so the investment in plant and buildings is significantly lower. Transportation of the racks through the modular system is controlled by a timer to which an audible alarm is fitted. The timer is set after calculating the rack throughput rate, dividing the baking time by the number of oven modules and this indicates the intervals at which a fresh rack is drawn into the system. The oven is brought up to temperature within a very short time, normally ten minutes. Operations are started with unladen racks already in the system and a loaded rack at the entry point. This rack is automatically drawn in as soon as the timer is started, with simultaneous discharge of a rack from the cooler. A second loaded rack should be prepared in time for the cycle. A warning buzzer will sound if there is no rack ready. At the end of a baking shift, empty racks are used to clear the last of the full racks through the oven and so recharge the system ready to start again. If you wish to receive a brochure about the Tunnel Rack Oven please contact us here or download the brochure in a PDF file format in the downloads section, which can be found here.